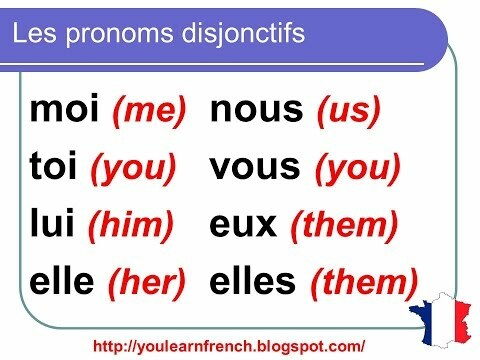 Just like in English we have 'I' and 'me' (but note, only 'you'), French uses these so-called singular Stress Pronouns. Note : elle is the same in both. Me, my name is Tim. Je veux une glace au chocolat mais elle, elle veut une glace à la vanille. I want a chocolate ice cream but she wants a vanilla ice cream. Note that in English, you would usually use intonation to mark emphasis. Qui veut un cadeau ? Moi! Moi! Who wants a present? - Me! - Me! Qui est ta copine ? - Elle. Who is your girlfriend? - She is. Oui, c'est toi le menteur! Yes, you are the liar! literally: Yes, it's you the liar! Honestly, I did not really understand exactly you meant by '' stress pronouns''? Please throw more light on the meaning and use of stress pronouns. They are just another set of pronouns, sometimes called emphatic pronouns.